Saimon De Oilveira, new face appearing at the Baltic Games – Extreme Sports Festival! Only on our website you have a chance to get to know a little bit about Saimon. I encourage you to read the interview ! I would like to introduce you to a person who has come here specially for The Baltic Games. 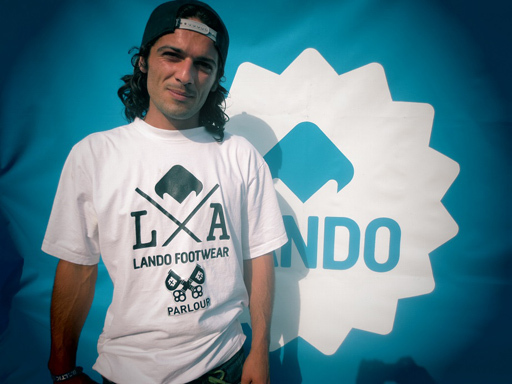 He is our new team rider, Saimon De Oilveira sponsored by LANDO. Ewelina Braca: Saimon, please say a few words about why you have chosen to pursue skateboarding, as opposed to other sports? Saimon De Oilveira: Honestly, I really liked skateboarding from the first time I saw it, but actually I played football for 2 – 3 years before I started skateboarding. You know, many Brazilians dreamed/dream to be a football player and when I was younger I wanted too, but from early beginning skateboarding was the only sport I have identified the most with me. Ewelina Braca: I have had a pleasure to talk to you before so I know you are from Brazil, but you live in London. I have heard that the second most popular sport in Brazil is skateboarding and the skateboard scene is very well developed. Tell me how it looks like in reality? Saimon De Oilveira: The skateboard scene is in fact more developed than you can really imagine. Brazil, as you know is a huge country and it is very hard to find a sponsor, because we have a lot of talented riders, so you can see that the bar is set high. Ewelina Braca: As someone who has been skateboarding for a long period of time I am sure you have witnessed many changes in the sport. In your opinion, how do you think the skateboarding scene has developed and how is it changing? Saimon De Oilveira: In my personal opinion, skateboarding is developing much faster than you think. In fact, I can only talk about Brazil or London, because as you know I am first time in Poland. Really, I observe a lot of very good riders and the factor which shows that the skateboarding is developing in the right direction is that they make a career. Ewelina Braca: Let’s leave the subject of skateboarding for a while. Tell me what your average day in London might look like. Is there any place there that truly garners your attention? When I was in London I liked Camden Town. this is a club called 1051. Ewelina Braca: Do you have your favorite places to go and just take a rest after work? Saimon De Oilveira: It can sound funny, but even when I am tired after work I go to take a rest in the skatepark. I feel like I charge my battery. Ewelina Braca: What places do you recommend, with hand on heart, for skateboarding in London? Saimon De Oilveira: With hand on heart, it is without a doubt the Mile End. I go there after work almost every day. Ewelina Braca: When I observe how riders behave in the skateparks, to me, they are suicidal people (laughing). Do you prefer riding when the skatepark is almost empty or with bigger groups of people like here today? Saimon De Oilveira: I know what you mean, for me better when the skatepark is almost empty, because I feel more confident. I do not like this kind of situation we can observe here today, when we have a lot of riders and you have a feeling like they ride straight on you and you feel disoriented. I have to say that here is a very friendly environment, lots of trees, greenery, really nice Ewelina. Ewelina Braca: Tell me something about your skateboard group in London? Saimon De Oilveira: My group of people with whom I ride is really diverse. They come from different places of the world, for example from Portugal, South America, Spain, Greece, New Zealand, and of course from Poland. I really like spending time with them, they are for me very positive persons, they are individualities. Ewelina Braca: What do you think about the new premium skate Lando collection? I see you haven’t forgotten to wear Lando shoes today ! I see they brought you luck in the contest, because you get to the final. Saimon De Oilveira: Of course I am wearing Lando shoes today. I really like the new premium collection, because it is easily to see that it was thought and high level of creativity has been applied, but what is the most important, shoes are durable. Really, really great. I like them. Ewelina Braca: Why you have chosen Lando among so many other brands? and I think Lando is even better. Ewelina Braca: Is there any specific greeting that is common amongst skateboarders in Brazil or England? In Poland the popular greeting among skaters is ‘Yoł ziom’ whatever that means or specific clothing? Saimon De Oilveira: You know, in London you can observe gangsta style, very skinny trousers and of course tattoos. They do not use any specific greeting, because you have to be careful. In Brazil the most popular is ?Hamer? and ?Cool?. I know it sounds strange, but you use it only if you know people. Ewelina Braca: Tell me something about your favorite tricks, which you like the most. Saimon De Oilveira: I like most technical tricks on switch. Ewelina Braca: It was really nice to meet you Saimon. Thank you for the interview! Take your time and have fun here in 3city with Lando team!